For the longest time, I've put off getting this book because I did not like the art on the cover. 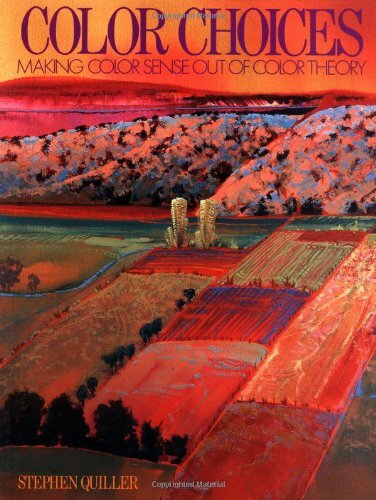 The cover art did not look nice enough for a book that talks about colour theory. I bought this book because someone told me to check it out. Now that I've gone through the book, I've got to say that it's a fantastic book on colour theory and mixing. Don't judge a book by its cover, they say. This 144-page paperback is written by Stephen Quiller, artist, author and instructor. I've seen his name around on online art forums, more specifically his colour wheel. Different artists have their own colour wheel, a reference to help them create harmonious colour mixtures. Quiller has his own version of colour wheels and what I found most illuminating is the concept of beautiful semi-neutral colours. The book says that each colour will have its perfect complement and when mixed will give you that beautiful semi-neutral colour that's used for most part of the painting. That's the information that I've been looking for. I've many books on colour mixing and none has put it quite clearly as this book when it comes to mixing those beautiful neutral colours. This book also features colour schemes along with many examples. The writeup is insightful and easy to understand. Some examples show the same subject matter painted with different colour schemes. The text would explain why and how they work. The takeaway point for me is it's not necessary to paint the subject matter as you see it in real life. There are many ways of interpreting the scene with art. This book definitely deserves a spot on every artist's shelf. It's a book I'll revisit often. I just want to absorb all the information until they are part my subconscious. The book is that good. If you're interested in colour mixing, I also recommend Making Color Sing: Practical Lessons in Color and Design and Watercolor Artist's Guide to Exceptional Color. Love your reviews, they are so practical and insightful. Thank you! How would you say this compares to Exploring Color Workshop by Nita Leland? Nita Leland's book has more hands on exercises. Both are good books on colour theory. Artists think about colours different. Some of the concepts may be similar, but you'll also learn about the individual approach of other artists. Thanks, Teoh. Only just seen your reply!